The discrepancies pointed out in the 2007 Zodiac documentary have been extensively covered on this site- and will be again, when we examine another section of the dialogue regarding the two main protagonists. It has been stated innumerable times, the contention that Donald Fouke and Eric Zelms not only stopped Zodiac, but were directed away from the crime scene by the killer toward Arguello Boulevard. Donald Fouke stated in the 1989 'Crime of the Century' documentary "We proceeded on Jackson Street towards Arguello continuing our search, as we arrived at Arguello Street the description of the suspect was changed to a white male adult, believing this suspect was possibly the one involved in the shooting we entered the Presidio of San Francisco and conducted a search on West Pacific Avenue, the opposite side of the wall and the last direction we observed the suspect going, we did not find the suspect." We shall focus on the part of the 2007 documentary beginning at 1:18:09. After noticing a white male adult walking along Jackson Street, Donald Fouke proceeded onward, stating "Seeing that it was a white male in an affluent neighborhood walking along the street, we didn't think it was the suspect. So we proceeded the next block at...which was Jackson and Cherry. Turned southbound on Cherry Street and saw Armond Pelissetti, one of the officers who had responded directly to the scene" Was he about to say proceeded the next block at Arguello. Armond Pelissetti picks up the story "At that point Officer Dan Fouke, who was accompanied by what I believe was a rookie officer Eric Zelms at the time, pulled up very quickly in their police car, called out to me did I see anybody, did I know anything about where the suspect could be and I told him no." Donald Fouke continued "He stopped us (Pelissetti) and said he was looking for the white male that had just gone down the street. There was a little conversation about what the initial description was, and he said no, he was a white male. I then used a slang term and said 'oh that was the suspect'" Armond Pelissetti responded "He did not mention to me that he had seen anybody at that point or stopped anybody." We know that Armond Pelissetti was told the suspect was white by the three teenagers at the crime scene, and in his words "couldn't get to the radio fast enough at that point to let everybody else know." Armond Pelissetti stated "​The kids had told me whoever had done this crime had left the cab, went out the door and seemed to be wiping the cab down and reaching into the cab and ambling or walking down Cherry Street in a northerly direction, kind of towards the Presidio. I walked that way myself, I did not run because there are innumerable alcoves and parked cars, so I went down following every technique I knew so I didn't get my head blown off." We know that walking Cherry Street at a normal speed would take approximately one minute, but at least 90 seconds to 2 minutes if you were "following every technique" in the police manual. So, after updating everybody to the new white male description, Armond Pelissetti likely informed his partner Frank Peda of the amended description and asked him to secure the crime scene, before heading off up Cherry Street. Therefore, by the time he met Officer Donald Fouke at the top of Cherry Street, at least 2 minutes must have elapsed. Assuming that Donald Fouke received the amended white male description almost immediately, then he must have received it before Armond Pelissetti headed up Cherry Street (approximately 90 seconds to 2 minutes ago). That is, 90 seconds to 2 minutes prior to meeting Armond Pelissetti. The journey time from Donald Fouke spotting Zodiac to reaching this section of Cherry Street (440 feet), traveling at 30 mph, takes only 10 seconds. Even if we gave Donald Fouke 30 seconds, one can see that by the time he spotted Zodiac, he would have already received the amended white male description at least 1 to 1 1/2 minutes prior to spotting Zodiac. So why didn't he stop him? The answer being; that Donald Fouke didn't turn down Cherry Street, but continued on to Arguello Boulevard (where Zodiac directed him) and down West Pacific Avenue, before returning to Cherry Street, where he met Armond Pelissetti. This diversion by Donald Fouke took just over 2 minutes. We know this, because, in the 1989 documentary Donald Fouke stated "as we arrived at Arguello Street the description of the suspect was changed to a white male adult." Donald Fouke, realizing this was the man he had just seen on Jackson Street turn up Maple Street moments earlier and may be the possible killer, swung into West Pacific Avenue toward Julius Khan playground. After an unsuccessful search in this area, he returned toward the crime scene and bumped into Armond Pelissetti at the top of Cherry Street. This 2 minute diversion of Donald Fouke from Arguello, would corroborate Armond Pelissetti's 2 minute journey up Cherry Street after updating Donald Fouke over the radio from the crime scene, enabling them to meet at this exact point. Donald Fouke memorandum. Click to enlarge. One thing has always perplexed when we consider Zodiac's movements that night. Whether you believe that Zodiac had blood on his clothing that night or not, why would a killer who must have seen and heard Donald Fouke's approaching police car 'red light and siren' from quite a distance (possibly blocks away), as shown here on Google maps, why didn't he attempt to conceal himself. Not only that, why was he walking on the north side of the street in full glare of approaching vehicles, when the obvious choice would have been to turn from Cherry Street and stay on the south side until he reached Maple Street or his required turn off. If we take a look at the memorandum on the right, it is signed by Donald Fouke, but appears to be written on his behalf. 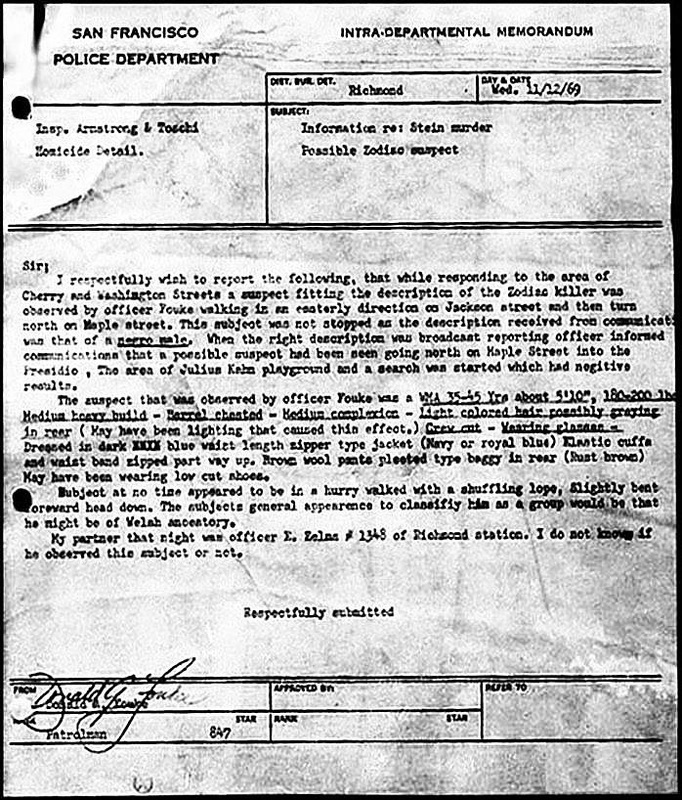 Nevertheless, it states "a suspect fitting the description of the Zodiac Killer was observed by Officer Fouke walking in an easterly direction on Jackson Street and then turn north on Maple Street." But there is no mention of which side of the street the suspect was on-bearing in mind this was dated November 12th 1969. Only later would it be mentioned that the Zodiac was apparently on the north side. With ample time to spot the approaching police car, this seems on the face of it, a strange choice by the Zodiac Killer, particularly if you are an advocate of a killer smothered in the victim's blood. Considering Donald Fouke was driving that night, coupled with his extensive description of the killer, wouldn't it be more likely the Zodiac Killer was walking on the south side of Jackson Street that night. In the Zodiac Killer's November 9th 1969 'Bus Bomb' letter, he stated "p.s. 2 cops pulled a goof abot 3 min after I left the cab. I was walking down the hill to the park when this cop car pulled up + one of them called me over + asked if I saw anyone acting suspicious or strange in the last 5 to 10 min + I said yes there was this man who was runnig by waveing a gun & the cops peeled rubber + went around the corner as I directed them + I disappeared into the park a block + a half away never to be seen again". When you read the last line of the memorandum it states "My partner that night was officer E. Zelms #3248 of Richmond Station. I do not know if he observed this subject or not." This appears a stretch, when you consider the detailed description of the subject given by Donald Fouke from the seat furthest away from the north sidewalk, especially when he claimed he slowed down for 5,10, 15 seconds. It is more believable if Eric Zelms is scanning the north side from the passenger seat and Donald Fouke is scanning the south side from the driver seat, and Zodiac is walking on the south side. If we believe Eric Zelms was being shielded from the events that night, and equally believe Zodiac's claims of being "called over" to the police car- and meshing it with Donald Fouke's extensive description of the subject- then it could be argued that the Zodiac Killer was called over from the south sidewalk by Donald Fouke. The Zodiac Killer would then direct Donald Fouke to Arguello Boulevard, and the article can begin again. It's difficult finding fresh insights anymore Drew. Hopefully this case is solved soon and we can move on to something else. Thanks for keeping the coverage going on the little mysteries Richard! You have stated in the past that you were virtually 100% that Fouke at least saw Zodiac that night, do you still feel that certain? I am not fussed about the lack of blood observed or the relatively minor discrepancies between Fouke's WMA and the Killer seen by the Robbins, but the only witness to see the killer turn right onto Jackson was Lindsey with his following Zodiac down Cherry story. If I recall your walking time calculations shed doubt on the accuracy of his claim. Don't get me wrong I do still think the WMA was Zodiac. When you are ready to move on I may have a good suggestion for you. The Michelle Martinko case of 1977 in Cedar Rapids is full of mystery and after decades of inactivity the investigation has finally gained steam over the last few years. My brother and I are considering doing a project about it, but it is American obviously and that presents problems for us. At any rate, I wouldn't go there if I were you until you are ready to be sucked away again! I think it actually may be solved soon though as they do have DNA to work with. Some people believe that this wasn't Zodiac or they didn't see anybody. But how would Zodiac know that two cops had passed him at the exact place that would eventually be revealed in the memorandum by Fouke. The memorandum actually verifies Zodiac's story. I think it's easy to dismiss everything Zodiac said because he is a killer, and is trying to make the police look stupid. But we can argue that the police equally have a vested interest in not making themselves look incompetent or had made errors that night. I actually don't believe Donald Fouke did anything wrong at the time he saw the killer. If he had truly been given a NMA description, then stopping the WMA to ask if he had seen anybody suspicious in the area is no cause to be admonished by his superiors. In hindsight, superiors often pass the buck onto their 'workers' to allay blame. In terms of the Robbins kid spotting Zodiac, we have to separate this version from other ones told. To me, there is the version incorporating the version with Pelissetti and Lindsay, and another without. It is like the Connelly/Gasser example, which change the entire timeline of the white Chevrolet. It seems half the battle is deciphering which versions make more sense. Eyewitness testimony is extremely useful and the bridge between 2018 and 1968/9, but it can also be incorrect and blighted by time. We know that Donald Fouke could not have turned down Cherry and meet Armond immediately after receiving the initial broadcast, because Pelissetti cannot do all he said he did and meet Fouke in just over a minute, but he can if he took the diversion he said he did in the 1989 documentary. I actually place a little more credence in the 1989 documentary than the 2007 documentary, because his memory was 18 years fresher, so to speak. It is also the only one that fits the timeline. For me, when we consider the encounter with Zodiac on Jackson Street, we have to answer one question only- why did Fouke drive away from the crime scene that night. At Blue Rock Springs- if the killer lived in Napa, Martinez, Oakland etc, then why did he take 40 minutes to report a crime from a payphone 10 minutes away. At Berryessa, did Zodiac park by Hartnell's vehicle, and which way did Zodiac turn after murdering Betty Lou and David. These for me are the 4 most telling questions in the Zodiac case. Thanks for the information on Michelle Martinko, I'll take a look Drew. Thanks for elaborating Richard, my faith in the Jackson/Maple encounter has been restored and the movements of Fouke's unit and Pellisetti on foot merge nicely with the diversion trip away from the crime scene. I think Fouke being directed by Zodiac makes more sense than Fouke deciding his unit should drive around investigating the possibility of entering the park at the end of Cherry and securing the outer area before checking in at the crime scene. So they likely would have received the corrected dispatch as they approached the Jackson/Arguello. Why Fouke cooperated by telling his story yet adamantly denied hearing the killer's voice is still a mystery. I agree that he shouldn't have felt like he screwed up responding to an incorrect dispatch. I think right now I’m at 50 percent Richard although I admit that’s mostly wishful thinking. If it’s ever gonna be solved this is as closest we’ll most likely ever be. I have a feeling we’re reaching the home stretch here and we might all get closure soon. I really hope so anyway. Hey Richard as a reader of every single one of your articles I just wanna say I feel your frustration and I agree hopefully we get some closure soon. We can’t give up on the case till we get him though. We will get him too. You have the best Zodiac site and just want to let you know your efforts are very appreciated so don’t feel down! I'll ask you a question Lemonboy- what percentages do you place on the latest DNA testing revealing the identity of Zodiac. I doubt we'll ever discover the identity of the killer, but I hope I'm proved wrong. I would relish the idea of a killer being caught and revealing all, unlike the GSK who seems to have become mute. We may then know where the killer lived, the mechanics of the crimes and the solutions to the cards and ciphers, if forthcoming. It may once and for all settle who was right and who was wrong in their analyses. However, that is a minor thing, when we consider that the biggest benefit of all, will be answers for the families and friends of the victims. Although justice would be belated, this is what matters most, rather than the fragile egos of Zodiac investigators scoring brownie points over one another. You are on to something. The scenario you depict is somewhat problematic, but one thing is certain. The person encountered by SFPD would not incriminate himself by mailing a piece of the victims clothing. So either there was an accompice or the perp observed the encounter from a hiding place. Thanks Tom for the response. That would mean the actual gunman was the one who cut the shirt and not the man at the 2nd stop who never tried to hide. That seems right. Glad that you saw the comment,elsewhere,Greg,and appreciate the courtesy,of your reply. Using the term ''Location'',is in reference to the perpetrator's nominated spot,to commit the serious crime. The percentages indicate that the perpetrator was from outside the city,and had intentions to abscond from the city,directly following the crime. All indications point to ''Zodiac'' leaving the crime scene,in order to escape north,in a getaway car,before the possibilities of roadblocks. A resident,or refuge criminal,might have to consider ''house to house'' searches.....certainly available to the police,and with the military's assistance,if deemed necessary. This very specific type of crime was going on in Belfast,all the time,and probably inspired Zodiac. Since Stine's murder has yet to be solved,many solutions can be put forward.....but,playing the percentages,does not favour a local resident,being the perpetrator. Despite all the investigation we've done looking into various cards and letters Rubislaw, take a look at the rare occasions 'Zodiac' capitalizes his G. In the 408 cipher and 340 cipher he doesn't write a conventional G- he misses the right hand side dash. In the Halloween card he writes it the way most people do. Is this a mistake by a hoaxer? The Fairfield letter switches from a one sided G (in the 340) , to both sides only one month after the 340 cipher. Is this another mistake by a copycat. Profuse apologies for calling you ''Greg'',Carl.And,to Greg. I will check out your blog,regardless. Sorry Richard....just focusing on Stine's actual murder. Will look into the capital 'G's',shortly. Just off the cuff,Richard,for I really will look at the capital 'G's'....''Zodiac'' has had a tendency to express 'J's',sometimes with,and sometimes without the top dash. I think we are looking for ''consistency'' [?]. Even if that consistency is ''inconsistency''. Yes,I see what you mean,with the capital ''G's'',Richard. In both the 408 and 340 cipher layouts,''Zodiac'' employs all the same ''G's'',with the left dash,only. Then,with the back of the Halloween Card,a ''G'' with a full dash. All three correspondences have ''confirmed'' authenticity. ''That'' back of the Halloween Card does seem to be a ''one off'' [?]. Everything is in ''presumed'' capital,except the ''y's'' of the ''By's''.Also,a mirror image ''N''.....and,most strange of all,capital ''I's'' that resemble lighted candles....really ''giant'' lower case ''i's''. I wonder if the ''lighted candles'' effect,is deliberate ? I will have to have a good look at the Fairfield letter.Generally,I am still convinced of ''authentic Zodiac''. The connection between the ''Bleeding Knife'' and ''Dripping Pen'' is tantalising.I have recently noticed that the three drops,from the hanging pen....are red [!]. Well,well....Richard....I have probably answered my own question,regarding the significance of ''candlesticks'' on the back of the Halloween Card. Thanks [! ]....Zodiac was telegraphing the answer to Z32.He had given enough clues,three months earlier....and yet no one could see it. I will go back to the Albany cryptogram,at some point....for it may not be quite what it seems. I suspect now,that the solution actually involves a fellow Texan,of Zodiac's,and 'car nut',who sang lead vocals,with then new rock act,''The Eagles''. I agree with you and Lemonboy,Richard.The cops aren't entirely stupid,and we must not give up. I know a man,who can ''deliver'' eventually.I have insulted him,and complimented him,in equal amounts. It's just going to take more time,and we must just hang in there. It's always worth trying to learn more,about ''Mr.Z''.